Is There a Global Business Code? We all know the famous expression “When in Rome, act like the Romans.” But nowadays in global business, cultural adaptation isn’t often as simple as that. It’s often not the simple case of a person from Culture A trying to interact successfully in Culture B, as this expression implies. Instead, it’s often much more complicated: try two people from Cultures A and B operating in an entirely new culture: Culture C. And what happens in these types of situations? When I posed this question recently to a group of seasoned global managers, an interesting answer emerged. What these managers suggested was that in these cases where no particular cultural code applies, people often default to what might be referred to as a “Global Business Code” — a distinct, recognizable blend of many different cultural styles all rolled into one. Let me illustrate with an example. Let’s imagine that a Brazilian manager from Rio, is in Istanbul to meet with a potential new Taiwanese business partner. Does the Brazilian switch from his warm, inviting, highly personal and expressive style to what he perceives to be a more indirect Taiwanese approach? Or is his Taiwanese colleague expected to adapt his style to the Brazilian style? Chances are, if the meeting is in a neutral site like Istanbul, neither of these two options will occur. Instead, the two people will default to a “third” code, which, from talking with various business people around the world, I’m increasingly coming to see as a global business code. As a savvy international businessperson you may already use this code when interacting across cultures, and if not, chances are that you have observed it in action, in the lobbies of international business hotels, conference centers and airports around the world. What does the code look like? Seasoned international business people I spoke with described it as a distinctly “middle range” culture style — more Western than Eastern, in the sense that people from Western cultures tend to have an easier time switching into this mode than people from East Asian cultures. But it’s also not as “Western” as, say, the typical US business style. For example, the global code has a style that is slightly more formal than in the US, but not as formal as countries like Japan, India, or Korea. It’s slightly more restrained than the emotionally expressive style of certain Western cultures, but again, not as restrained as in some Eastern cultures. Because it resides somewhere in the middle range, people from different parts of the world need to adjust in different ways when using it. Largely speaking, people from Eastern cultural backgrounds will need to enhance their level of directness, informality, and emotional expressiveness a bit, whereas people with styles characteristic of Western backgrounds will have to tone it down. In my view, this global business code typically happens in situations where “turf” and “power” are not 100% clear. If the situation is on your home turf and you’re in the high power position – say, a Russian CEO meeting with lower level business partners from another country – this code will likely not apply. You’ll likely revert to your native code on your home turf and in a high power position. Alternatively, when you’re in a low power position and on someone else’s turf – say, a Russian job candidate seeking a job in the US – this global code will also likely not apply. You’ll just adopt the cultural rules of the new country you’re operating in – in this case, the US. Where the global business code “lives” is in the more ambiguous, but increasingly common, situations where the implications of power and turf are not entirely clear. Say, for example, you are an Egyptian manager meeting your team of multicultural employees in Mumbai for a training session. Or you’re a Nigerian diplomat in Switzerland meeting with business leaders from Norway. Or you’re an American executive at a global training session for your company in Mexico. In each of these cases, the cultural code in action will probably be something more resembling this global code than the code of any single culture. What can you do as a manager about the possible existence of this Global Business Code? First, you can look out and watch for it. Typically we think about only two cultural codes – our own and the culture we’re operating in. But realize that in certain situations, being effective doesn’t just mean learning about the new culture you’re in: rather, it means mastering this more middle-range, global style and recognizing situations where it might be useful. Second, watch and observe how and when people use this global code and see if you can potentially develop your own version of it. Truth be told, there is no systematic empirical evidence — yet — that such a code exists. However, from speaking with many different business people from around the world, I personally believe that it does, and many of them do as well. If you do, it may be worth observing it in action and seeing if you can customize your own version of this middle ground cultural style. Who knows? Maybe for you, it could potentially substitute in certain cases for having to adapt to the very particular style of a different culture you’re operating in. In other words, if you’re Japanese and working in the US, maybe adopting this more middle range global business code might actually be easier for you than going full throttle into the American cultural code – and to the extent that it actually “works” in this new setting, it might be an easier solution for adapting your behavior than fully “acting like the Romans” when in Rome. Don’t get me wrong: national cultural codes still exist in many cases. People are still interacting and doing business according to local cultural rules. 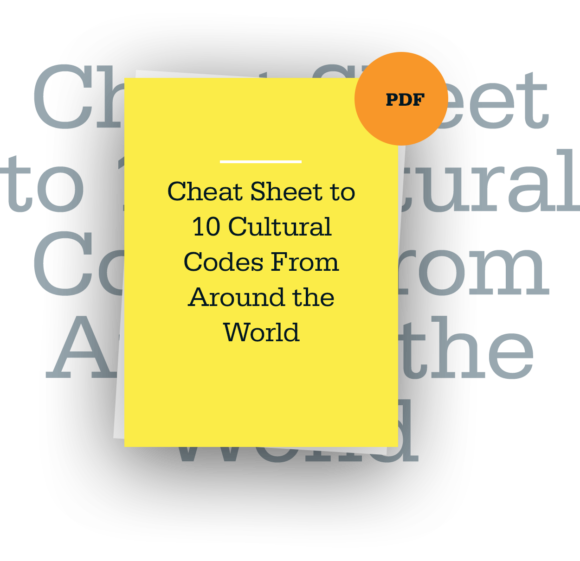 However, as businesses are increasingly globalizing, and as individuals within these companies are living, working and being trained in a range of cultural contexts, some of these national codes do appear to be melting, or blending, or morphing. Does this global code sound familiar to you? Andy Molinsky is a Professor of International Management and Organizational Behavior at the Brandeis International Business School. He is the author of GLOBAL DEXTERITY (HBR Press, 2013) and REACH: A New Strategy to Help You Step Outside Your Comfort Zone, Rise to the Challenge, and Build Confidence (Penguin, forthcoming – early 2017). Follow Andy on twitter at @andymolinsky. The material in this post is adapted from my new book Reach: A New Strategy to Help You Step Outside Your Comfort Zone, Rise to the Challenge, and Build Confidence (launching January 24, 2017 with Penguin Random House). There is a significant problem in corporate America today with foreign workers and it’s not the problem Donald Trump is obsessed with (that there are too many foreign workers). The internationalization of business education is nothing new. Case studies featuring foreign companies are taken for granted in MBA programs.